Enjoy superior free-to-view digital TV (DVB-T, also known as DTT or Freeview) reception on your Mac deep indoors, in weak coverage areas, and while travelling at high speeds, all thanks to EyeTV Diversity’s revolutionary antenna diversity technology. In Diversity mode, the two integrated tuners are set to the same frequency. EyeTV Diversity contains a Digital Signal Processor (DSP), which uses information from both tuners to generate the best signal possible. In Dual-Tuner mode, EyeTV Diversity becomes two conventional digital TV receivers in one, enabling you to watch one TV show and record another simultaneously. This amazing TV tuner stick provides superior digital television reception (DVB-T, or Freeview) deep indoors, in conditions that are challenging for reception outdoors, and while travelling at high speeds. EyeTV Diversity contains two integrated receivers and two portable rod aerials that work together to achieve optimal reception in Diversity mode. In Dual Tuner mode, they operate independently as two distinct tuners so you can watch two different channels picture-in-picture, or watch one show while you record another simultaneously. Even if you live in an area with strong DVB-T reception, or if you use a rooftop aerial, EyeTV Diversity is an attractive choice. In Dual-Tuner mode, EyeTV Diversity becomes two conventional DVB-T receivers in one. It’s the only EyeTV product that enables you to watch two live TV channels Picture-in-Picture, or watch one show while you record another. EyeTV Diversity comes with a unique splitter cable which makes it extremely easy to connect a rooftop aerial, if desired. The result of this Antenna Diversity (AD) and multi-tuner technology is superb reception deep indoors, in weak DVB-T coverage areas, and at high speeds. In tests, the technology provided good reception in 95% of locations within the home (compared with 67% for conventional receivers), and a 50% improvement in the quality of the television signal. 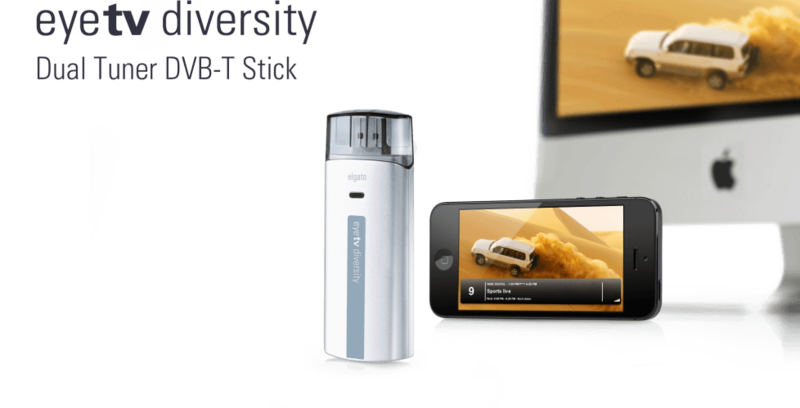 EyeTV Diversity is ideal for travellers. The ultra-compact device and portable rod aerials pack easily with a MacBook, and mobile reception is possible at speeds up to 160 km/h provided there is uninterrupted DVB-T coverage en route. EyeTV Diversity has one quality setting, lossless. The DVB stream is recorded unaltered, and so you’re getting full quality unencrypted DVB-T content as encoded by broadcaster. EyeTV Diversity supports DVB-T multilingual programming and Dolby® Digital sound. Bonus: Do you plan to use EyeTV Diversity with an Intel Core Duo processor? In areas in which HDTV is broadcast via DVB-T, enjoy watching stunning 720p or 1080i HDTV (MPEG-2 as well as H.264/AVC) on your Mac. With its classic matte aluminium finish and amazingly compact size, EyeTV Diversity looks great with a Mac. It features a USB 2.0 interface for the streaming of superior quality TV content to your Mac. EyeTV Diversity is USB powered and therefore requires no external power supply. You can use EyeTV Diversity with a Mac or PC. EyeTV Diversity is compatible with Windows 7 or later and works great with Windows Media Center. It also comes with THC software for Windows, which offers many of the same features as EyeTV 3. EyeTV Diversity is intended for use in countries where digital terrestrial television is broadcast. Digital terrestrial television is also known as DVB-T, DTT, Freeview in the UK, and TNT in France. DVB-T reception can vary by location, and a rooftop aerial may be required in areas with a weak or obstructed DVB-T signal. "The saying ‘strength through diversity’ holds true for Elgato’s new TV system." "...it is a fabulous system, and for those living in areas with poor reception,it’s the only thing available that will put TV on your Mac."